Heather has been playing stringed instruments for over 23 years. She started on Viola in grade school, switched to Cello in high school, and then Violin in college. Heather began Irish Fiddle about 7 years ago, as a result of her involvement in Irish Ceili and Set Dancing. Since then, she has travelled around, constantly in search of new tunes and techniques. She has had the privilege of learning from many great Irish, Bluegrass, Old-Time, and Jazz fiddlers, such as: Maria Terres-Sandgren, Ed Paloucek, Liz Carroll, Liz Knowles, Liz Doherty, Matt Cranitch, Seamus Kennedy, James Kelly, Denis Liddy, Sean Cleland, Tommy Peoples, Paddy Glackin, Crystal Plohman, Buddy Spicher, Bobby Hicks, Martin Norgaard, Vassar Clements, Siobhan Peoples, Eileen O'Brien, and Maire Breatnach. Heather is a frequent Feis Musician, and also enjoys playing for ceilis and set dancing. She can often be spotted at Irish and Bluegrass Sessions across the Midwest. Heather has recently fiddled in Ireland, England, Eastern Europe, and Japan. She is currently a student at UW-Milwaukee in the Celtic Studies Department. She previoulsy earned Bachelor's Degrees in Anthropology and American Indian Studies from UWM, and is hoping to finish her Celtic Studies Degree this fall. 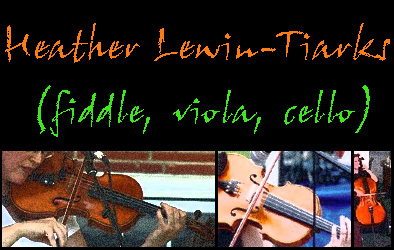 Heather teaches private violin, viola, and cello lessons in the Milwaukee area. She offers classical and fiddle styles.